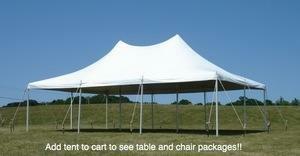 20' by 30' Pole Tent. - Kwik Covers ($4.50) or linens ($8) for tables in your choice of color. - Color wash lights ($80).